The Johnson Bros. foundry was located at 213-217 Grand St. from 1871 to 1903. This ad appeared in the Trow New York City Directory, 1883. In 1872 an ad for Johnson Bros. was similar except Johnson Bro's were successors to Cameron & Johnson, and the only address was 215 & 217 Grand Street. The later ad from 1883 shows Johnson Bros. still located at this address. Allen Cameron (1806/07-?) first appeared in New York city directories in 1854-55 when he was a clerk living at 270 East 7th St. He was recorded in the U. S. Census of 1860, living in Ward 19, District 1, Brooklyn. He was 54 years old, born Connecticut. Trow, 1862, specifies Cameron's home as 3 Hamilton Place, Brooklyn. The 1870 U. S. Census listed Allen Cameron, age 64, still living in Brooklyn's 19th Ward. In 1880 he was 73 years old, born Connecticut, "Manf. Iron Railings," and lived at 120 Clymer St., Brooklyn. William B. Johnson (ca.1815-died before 1870) appeared in New York city directories in 1850 when he was a blacksmith living at 319 East 6th St., Manhattan. The U. S. Census of 1860 recorded him, age 45, a blacksmith, living in New York's Ward 17, District 3. His wife, Jane Eliza, was 39 years old, and their sons consisted of William B. Jr., 22, John B. 20, Henry R. 17, and Isaac Carhart, 12. He seems to have died prior to 1870. His wife, Jane Johnson, lived at 65 2nd Ave., Manhattan, in 1870, and was head of household, living with sons, Henry, age 25, and Isaac, age 20. Trow's New York City Directory listed Jane Johnson, widow of William B., living at this address in 1869 and 1870. John B. Radley (1820/21-1890) first appeared in New York city directories in 1856, by which time he was probably a member of Cameron, Johnson & Radley. Radley withdrew from the company around 1865 and formed a partnership with Valentine Cook (Cook & Radley). For more on Cook & Radley see their foundry marks page. 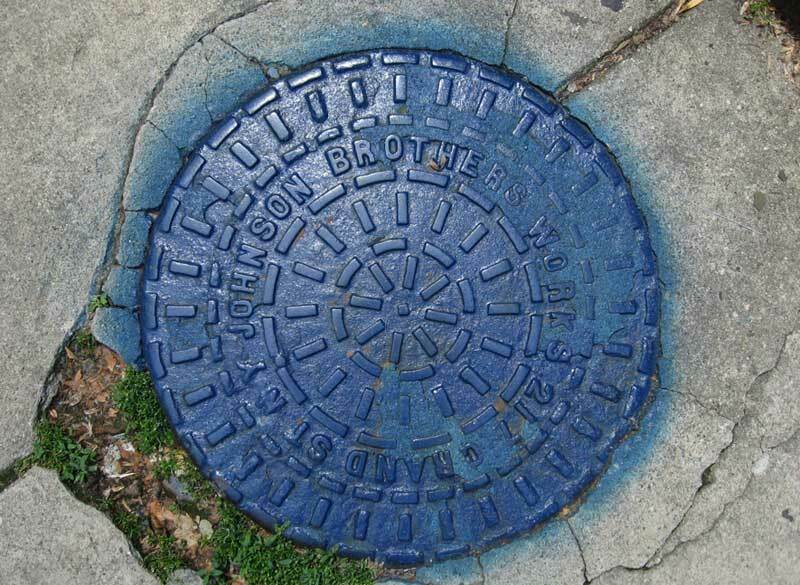 The Johnson brothers who succeeded Cameron & Johnson in 1871 consisted of three sons of the original William B. Johnson. These were William B. Johnson Jr. (1838-? ), John B. Johnson (1840-1910), and Henry R. Johnson (ca.1843-?). A fourth son, Isaac C. Johnson (1849?-? ), was also part of the business. Iron grates found on St. Joseph's Church in Greenwich Village are also inscribed Johnson Bros. They can be seen on the Johnson Bros. Washington Place page.